After recuperating in the room, Boxford’s Linda Holt tackled the project, transforming it into a favorite spot. Interior designers, says Linda Holt, often put their own homes last. 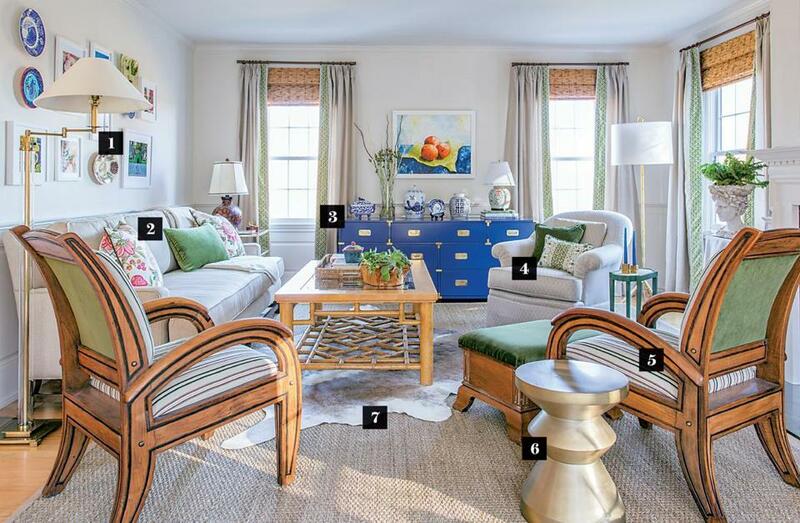 That was the case with the dated, mismatched family room in Holt’s Boxford home, a project she postponed for two years. Then she was diagnosed with breast cancer. “I spent the better part of the summer lying on the sofa thinking about how much I hated the room,” recalls Holt. Now cancer free, she recently tackled the project, updating the space’s aesthetic. “The last thing I wanted was a sophisticated, dark room,” says Holt, who shares the home with her husband. 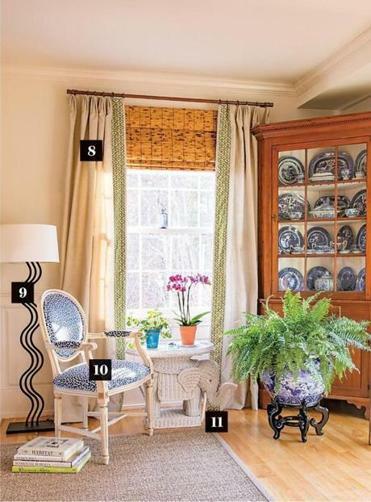 “I chose bright, happy colors that make me feel good.” Furnishings are a range of high and low, and many pieces have sentimental value, including blue-and-white china from her mother-in-law, showcased in the corner cabinet. The warm, cheery space is now one of Holt’s favorite rooms. 1. A gallery wall was entirely do-it-yourself, says Holt. She hung vacation photos taken on her iPhone in frames from A.C. Moore, along with some cherished plates. 3. The room’s focal point is the large campaign dresser Holt bought for $85 at Habitat for Humanity ReStore in Lawrence. She had the piece lacquered a bright blue and the gold-tone hardware polished. 4. A chair that belonged to Holt’s grandmother is reupholstered in a neutral fabric: “A new chair would have cost over $1,000,” says Holt. 5. Holt had wooden chairs reupholstered with a taupe stripe fabric in front and green velvet in back. “The backs of the chairs are the first thing you see when you enter the room, so I wanted something striking to draw the eye,” she says. 6. A brass sculptural table from West Elm echoes the gleaming hardware on the campaign dresser. 7. The custom-cut sea-grass rug is from Landry & Arcari. An animal hide on top adds interest. 8. The neutral linen drapery fabric was an inexpensive find that Holt customized by adding a strip of higher-end Duralee patterned green fabric on the edges. 9. The curved black iron lamp is from a studio Holt had when she was a photographer in the 1980s. “I just can’t get rid of the lamp — it reminds me of that period in my life,” she says. 10. A rich velvet “Cheetah” print fabric by Schumacher revives an old chair. 11. Holt bought the wicker table with elephant-shaped base at a flea market and spray-painted it crisp white.